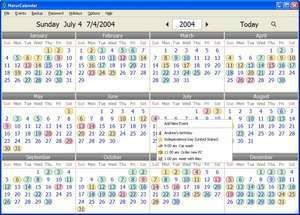 NaturCalendar is a desktop calendar and scheduler for your PC. The software allows you to keep track of birthdays, holidays, appointments and other events. It is also could be used as a diary. Version ST now runs in the system tray, so you will never miss your upcoming reminders, it currently includes 39 predefined world holidays, human voice sound for reminders, multiple event colors, USA and European date formats. NaturCalendar ST is a shareware program and can be used as a demo to try the software until the free trial period has ended. A full version of the program is available after the trial period ends. For security reasons, you should also check out the NaturCalendar download at LO4D.com which includes virus and malware tests. Additional screenshots of this application download may be available, too. 3.2 out of 5 based on 10 ratings.